As we launch into the New Year, we want to take a moment to look back to 2018 and update you about all we’ve accomplished. Through the generosity and support from all our World Housing partners, we were able to raise $318,500 this past year. This has funded and allows us to build 41 more homes for families, which will house 205 people for generations to come. Adding these homes will bring us to a total of 625 homes which is just about a third of the way to our mission of building 2,000 homes and housing 10,000 people. Our building this year was focused in 4 countries: Colombia, the Philippines, El Salvador, and Mexico. And as we move into 2019 our plan is to continue to direct our efforts into El Salvador and Mexico with our building partners New Story Charity. We want to firstly acknowledge the beginnings of World Housing — if not for S&P Real Estate business partners Pete Dupuis and Sid Landolt, none of this amazing work would be possible. In 2013 these two innovators in luxury real estate co-founded World Housing and allow it to continue to transform lives. We also want to thank all our First Founders and Board Members who have supported World Housing organizationally and enable our 100% Model to exist. It takes a community to build a community! Based on the success of our beta test with Pacific Sotheby’s International Realty we continued to expand The Agents of Change (AoC) program in 2018. The program resonates deeply with real estate professionals. It provides a meaningful connection between the sale of homes at the top of the real estate pyramid, and the construction of homes for families living at the bottom in absolute poverty. AoC has now expanded to 3 brokerages, William Pitt & Julia B. Fee Sotheby’s and Sotheby’s Canada. Collectively the AoC program has 630 realtors involved and since it began in 2017 has raised over $330,000 USD and has funded 55 homes that will house a total of 275 people. We are excited to announce we will be launching the AoC program to the global Sotheby’s International Realty network of 21,000 realtors world-wide at the GNE in May 2019. Our incredible network of Ambassadors is the foundation of the World Housing community. This passionate group of philanthropists achieved so much in 2018, and we are continually inspired by their creativity and commitment to funding homes for families living in slums around the world. Richard Bell, of Bell Alliance, has been our most influential Ambassador working tirelessly for World Housing. In early 2017, he created the NexGen Forward Giving Group which includes Constance Fenyo, Dan Iosch, Stewart Hayashi, Andrew Morrison and Neal Cockshutt. Since it began, NexGen has fully funded the construction of 25 homes in Colombia & El Salvador. In October, Richard joined us in El Salvador to visit the Ahuachapán community where the NexGen homes will be built. His passion and support of World Housing has inspired many of our new partnerships this year including Dye & Durham, The Granville West Group and MLA Canada. 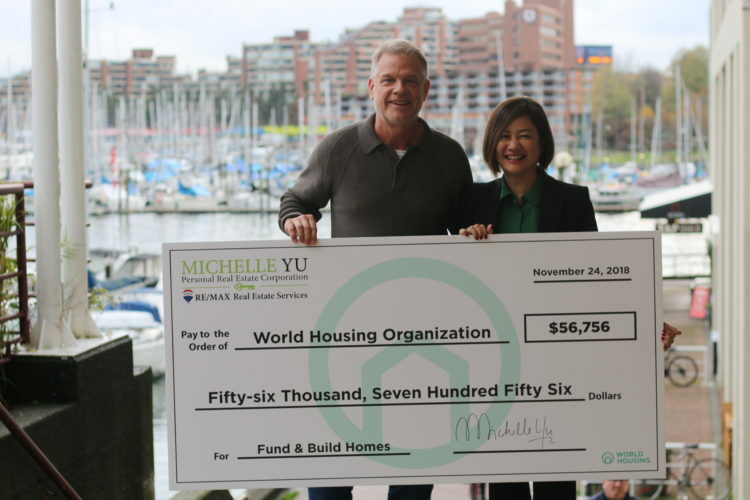 A leader in Vancouver’s residential real estate industry, Michelle committed to donate 100% of her commission from the sale of her listing on SW Marine Drive in Vancouver’s west side to World Housing. Michelle’s amazing contribution will build a 10-home community in El Salvador. Michelle continues to provide inspiration to all Realtors with her commitment to donate her commission from one home every year. We are so fortunate to have Michelle Yu as a World Housing Ambassador and look forward to traveling to El Salvador this spring to gift her homes and meet the families! If you would like to learn more about Michelle’s generous donation click here. 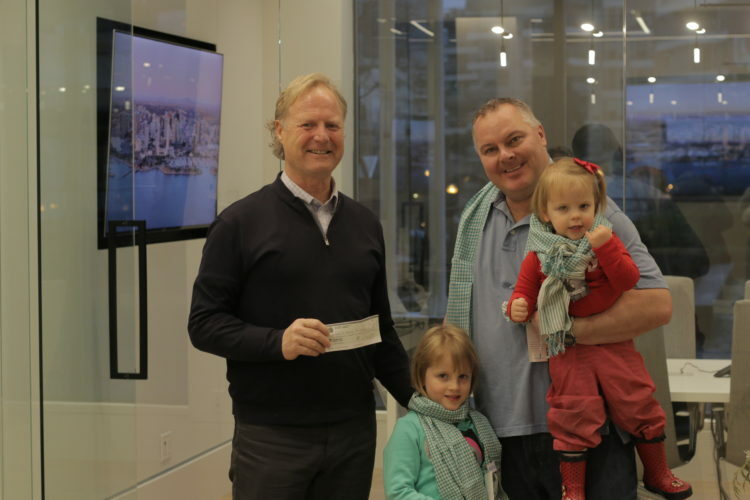 In December the World Housing team was paid a special visit by our long-time supporter Andrew Morrison and his two young girls Nicole and Michelle. Prior to coming in to present his cheque to us, Andrew had told his daughters about what it was like for the families they were helping. He showed them photos about what it is like for little girls living in these unimaginable conditions. Inspired to help, the girls made a donation from their own allowance to add to their Dad’s. It was incredibly heart-warming and we agreed the biggest and best gift of all this year! Thank you Andrew, Julie, Nicole and Michelle for your generosity — we are so grateful to have you as part of the World Housing community. Harnessing the power of AI, REX believes in using technology to grow their non-traditional real estate business. The REX executive team of Eric Rothman, Lynley Sides and Christina Shadle also believe in giving back from their success. They have committed that for every 50 homes REX sells, they will fund a home for a family in need. To date, REX has gifted 6 homes, 3 in Cambodia and 3 in Colombia with funds for 2 more slated for El Salvador. With a year ahead of anticipated growth in their business, they have generously committed to pay that success forward to fund even more homes this year. We look forward to continuing to transform lives with REX as our partners. HALE Real Estate Partners are located in San Diego, California and are three inspiring entrepreneurs who are giving back through their work. As they were starting their new company they believed it was important to establish a philanthropic arm to the business. They searched for a charity to support and it was our good fortune they happened upon World Housing. Matt Reams, Scott Russell & Kevin Newburg, with young families of their own, believe that no family should be forced to live in slums, and they’ve committed to donating part of the rental income they make from each unit they own. This past December they decided to share the World Housing message with their personal networks and held an event for their friends and families at the Regal Beagle, a local bar in San Diego. 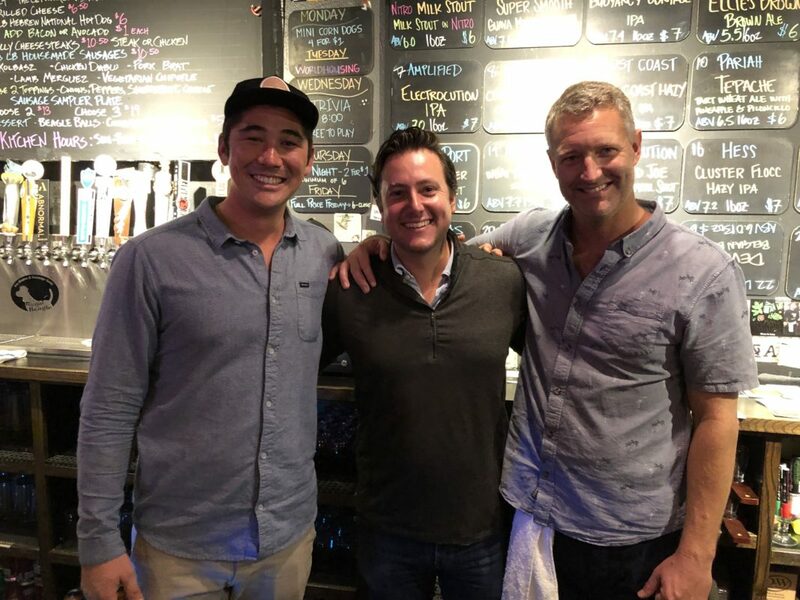 We want to say a big thanks to the Regal Beagle who generously donated a dollar for every beer sold, and Matt and Scott also gave their tips from their night working behind the bar. We love these guys and are proud to have them as World Housing Ambassadors. The first annual Home for the Holidays campaign was a huge success thanks to our dedicated network of donors and business partnerships. Together we raised $28,174 in December, and as with all our donations, 100% will be used to build 5 homes in El Salvador in 2019. A special thank you goes out to Bell Alliance, Granville West Group, Hestia Marketing Group, S&P Real Estate, Sol Guard Financial and Sammy Tseng for going out to your networks and asking them to get involved. A great big thank you to all of the following donors, we are so grateful for your support. We are continually inspired by all our donor partners who believe in us and our ability to house those living in absolute poverty. Without them, nothing we do would be possible and we are looking forward to continuing these foundational partnerships this coming year. We are also excited to announce we have several new partnership programs launching in early 2019 including MLA Canada & Cressey Development, Dye & Durham, Granville West Group, Milborne Real Estate, AREAA A-List Group. In May 2019 we will be introducing the Agents of Change program globally at the annual Sotheby’s International Realty GNE conference hosted in our home town of Vancouver. We are proud to partner with Sotheby’s International Realty and New Story Charity to offer this program to all Sotheby’s agents world wide. Aligning ourselves with organizations who share our passion and commitment for social change cannot be understated, that’s why we’re focused on building communities alongside our partners New Story Charity. In order to expand our impact we have committed to work with New Story Charity and target all our fundraising towards building homes using revolutionary 3D printing technology. 3D Printed Homes not only provide superior quality, but they can be built in 24 hours at a lower cost than ever before! This innovative approach ensures that our funds will go even further to provide more families with a home. In 2019 World Housing we will be part of building the first 3D printed home communities in Mexico and El Salvador. In these communities, New Story works through good relationships with local governments and other local non-profit organizations. This is critical to our ability to streamline the land acquisition and permitting process and prioritize home gifting based on the individual needs of the families. Having partners who are vetted to the highest standards gives us 100% confidence that your donation dollars are being used most effectively. –	Make a Donation at any time on our website and we promise that 100% of all funds will go towards building homes for families. Vancouver Realtor donates 100% of her commissions to build homes for families.